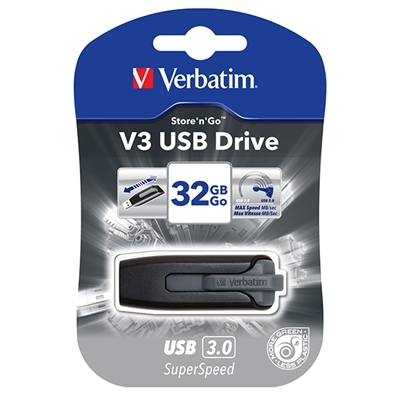 Featuring a USB 3.0 interface for SuperSpeed data transfer, the Store 'n' Go V3 USB Drive is up to 10 times faster than USB 2.0 making it faster for transferring and saving larger file sizes of all types. The design of the V3 USB Drive also ensures that the USB connectors are protected featuring a 'slide and lock' mechanism. This locks into position when using the drive and retracts back into a closed position to protect the connector when not in use. Simple and easy to use, just plug into any USB 3.0 port (also compatible with USB 2.0) and drag and drop your folders and files. • USB 3.0 SuperSpeed Interface. • 'Slide and Lock' mechanism protects the USB connector when not in use. • Verbatim limited lifetime Warranty.